The other day whilst filling my water glass at work, I happened to look at the contents of the vending machine just next to the water cooler. Nothing seemed out of place until I noticed something odd on the Walkers crisp packet. That little logo in the bottom right corner. SUNSEED™!!! What the hell is a SUNSEED™ and why does it need to be trademarked? I looked a little closer and the image looked like a bog standard sunflower seed to me. So Walkers are now frying their crisps in sunflower oil? Well, not exactly. I decided to checkout the Walkers website to see if I could get more information on what a SUNSEED™ was. SUNSEED™ oil is one of the healthiest oils there is, because it is naturally high in mono-unsaturates and naturally low in saturates. It is a special type of sunflower oil, made from a rare breed of seed. Oh, I seeeee! Thanks to this rare seed, that is sooo rare that it needs to be trademarked (me thinks GM), I won't get fat from eating too many crisps cos of this special oil. I don't think so! 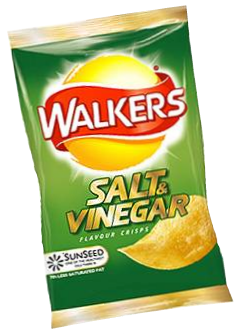 Oh and for those in the rest of the world, I didn't change the colours in the image - Walkers is the ONLY crisp company I know that gets the Salt & Vinegar and Cheese & Onion colours mixed up. Everyone knows S&V = Blue, C&O = Green.